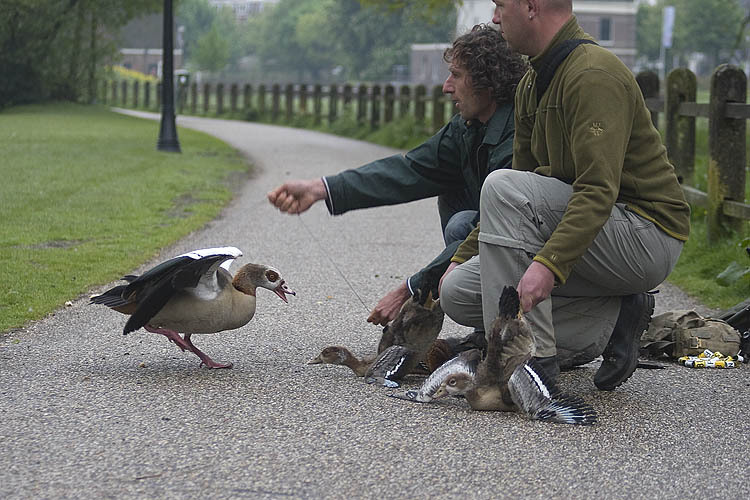 In 1999 in the context of the RAS-project I started fitting Egyptian Geese with a ring in the city parks of Arnhem. 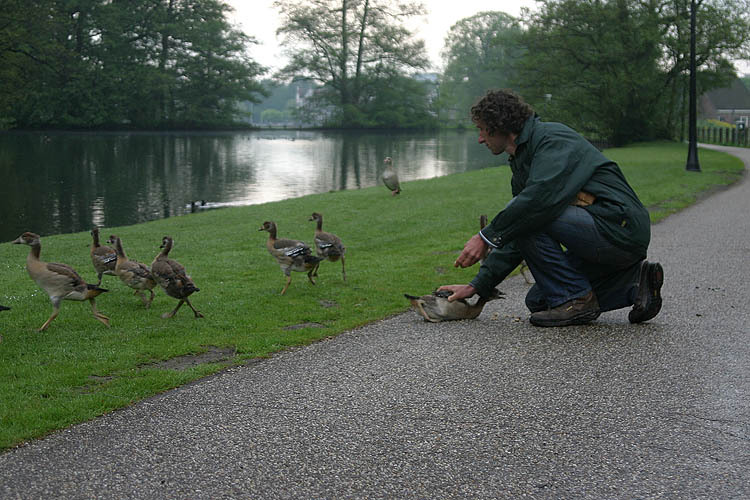 The research was started immediately when the first breeding pairs settled in the parks of Arnhem. 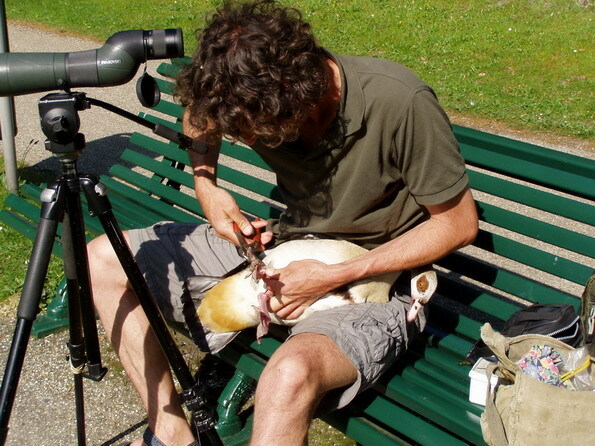 In the city parks in total there are more than 10 breeding pairs which breed successfully. This number has been more or less constant for years. 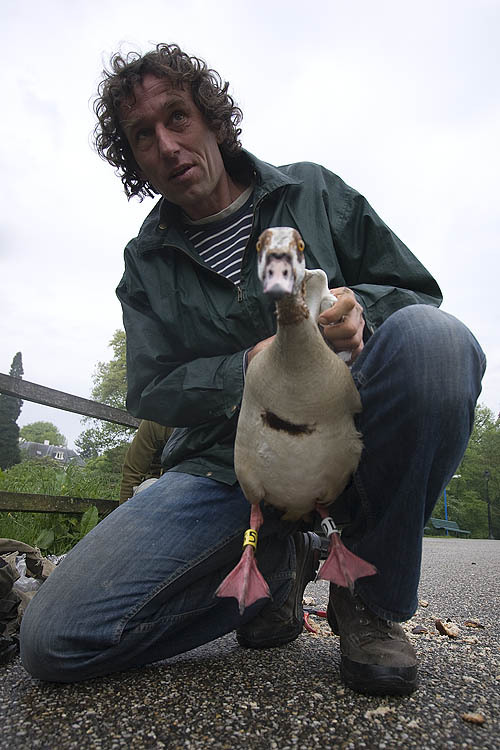 But in spring tens of pairs visit, especially in Sonsbeek, hoping to conquer a breeding site. From all these (potential) breeding birds the metal rings can be read relatively easy using a telescope. 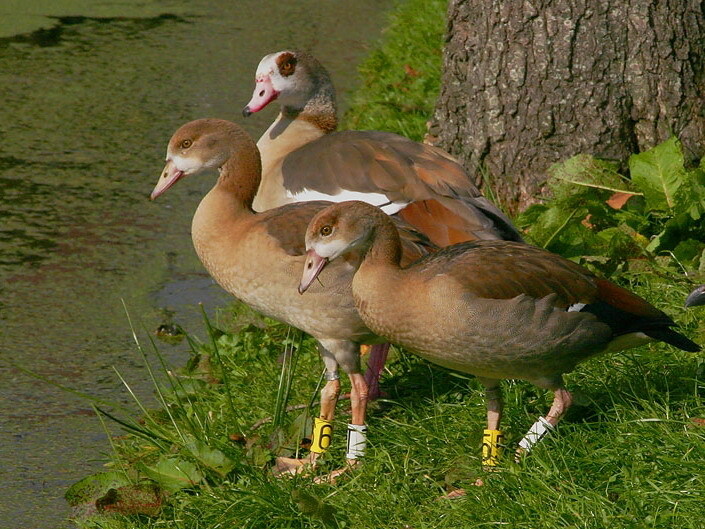 In 2009 I started colour ringing of young and adult Egyptian Geese (see below): Combination of 2 colour rings, each limb 1 colour ring: left white and right yellow. On every ring a letter, a number, or 1, 2 or three horizontal bars. 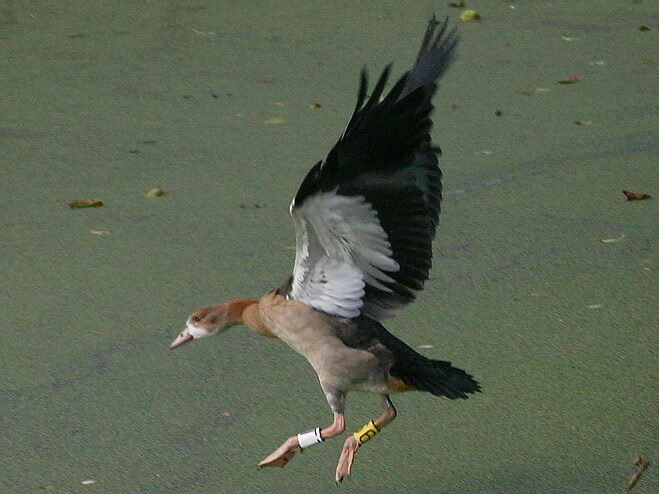 In addition, every Egyptian Goose carries a ring above the walking limb. Photo's below: Ana Buren, oktober 2010. 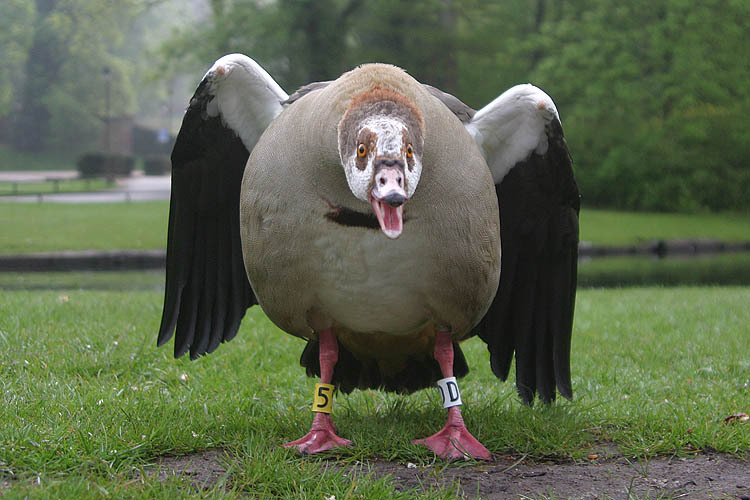 Nijlgans zit bijna vier maanden op hetzelfde nest. De Grauwe Gors jaargang 2012, pagina 30-33. Auteur: Klaas van Dijk. 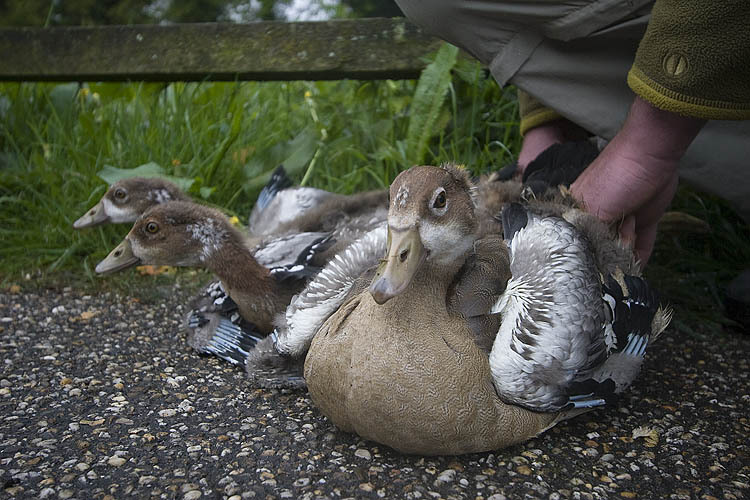 Een geval van adoptie van kuikens van Wilde Eend door Nijlgans . De Grauwe Gors jaargang 2011, pagina 70-73. Auteur: Klaas van Dijk. 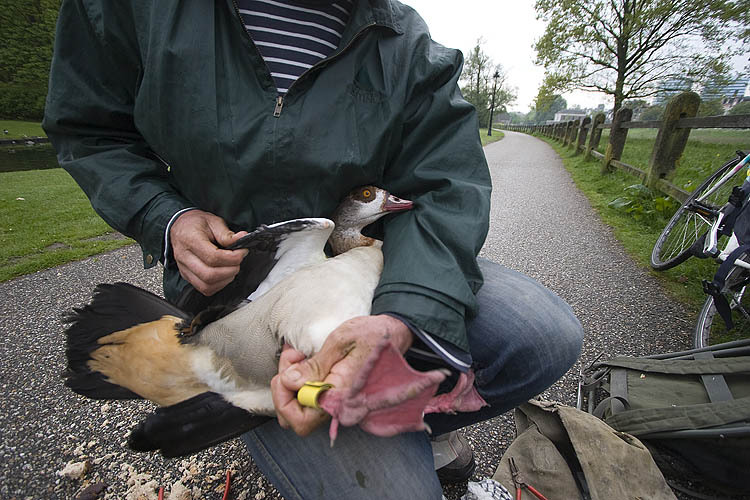 Natal dispersal of Egyptian Gees Alopochen aegyptiacus from The Netherlands to Germany and vice versa (Limosa 84 (2011): 82-84. Auteurs: Klaas van dijk & Frank Majoor. 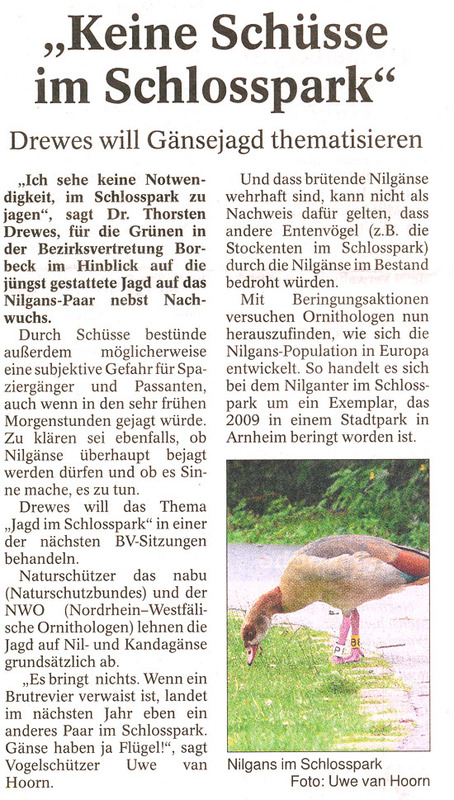 More about returning from previous years of Egyptian Goose see the article "Overleving van Nijlganzen rondom Arnhem 1999 - 2009" (Henk van der Jeugd & Frank Majoor). 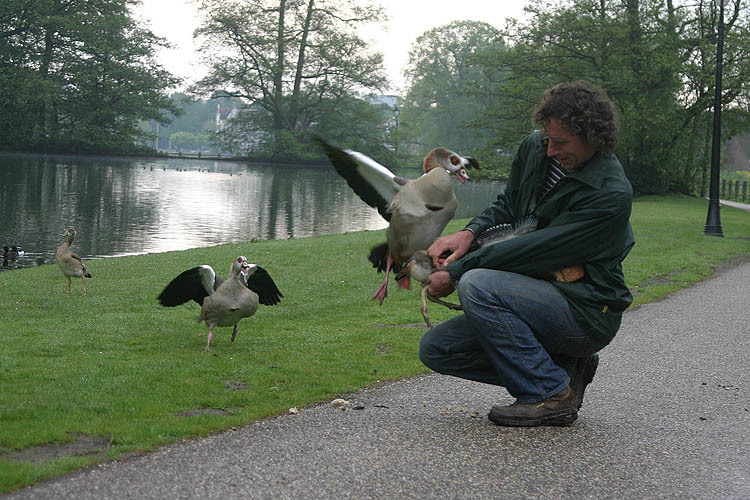 The catching and colour ringing of the first Egyptian Goose in 2009, Park Sonsbeek, Arnhem on April 26th, 2009. 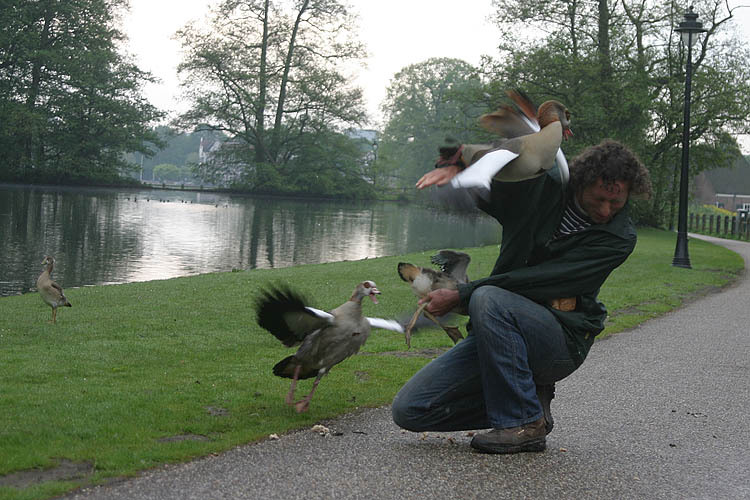 See the attacks of the parents after catching the young. Photo's: Harvey van Diek. Until now, from all the metal rings there are 4 reports from outside the study area. All four ringed as fledglings. Two birds were shot in the environment of Schalkwijk, 1 shot in Leerdam, and 1 killed by a crash against a powerline in Wijhe. 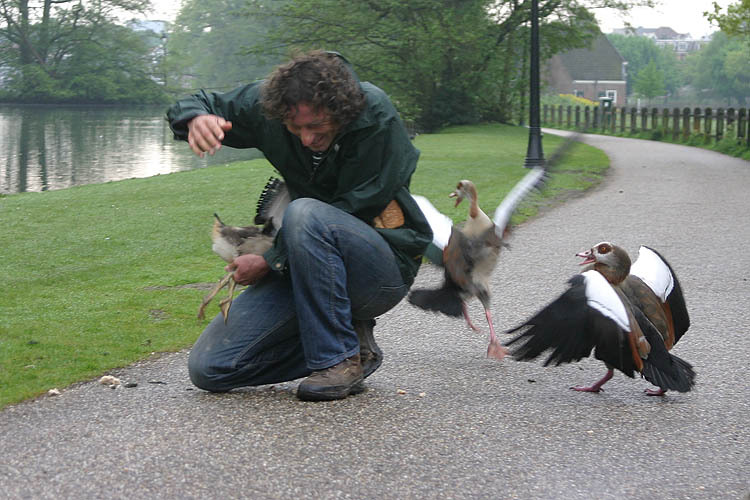 The birds which were shot, were 2-4 years old and in the mean time were never seen again in the study area. These recoveries suggest that birds born here can establish themselves far outside the study area. The colour ring project which was started in 2009 will have to show this. 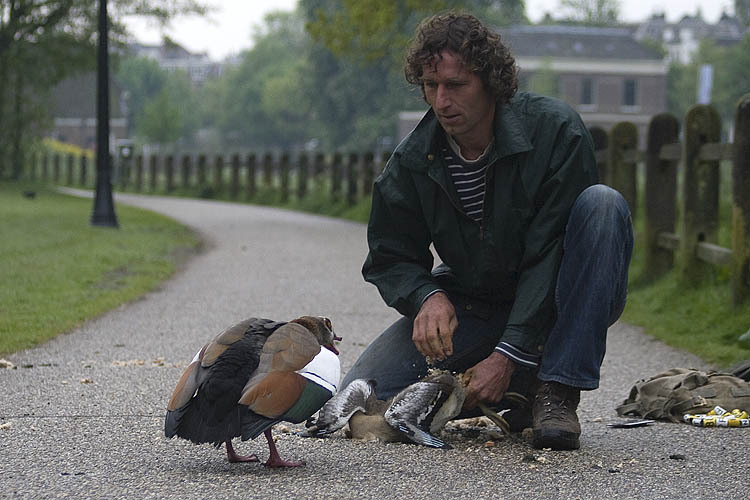 Frank Majoor ringt een Nijlgans, zomer 2008. © Anne-Marie Hamming. 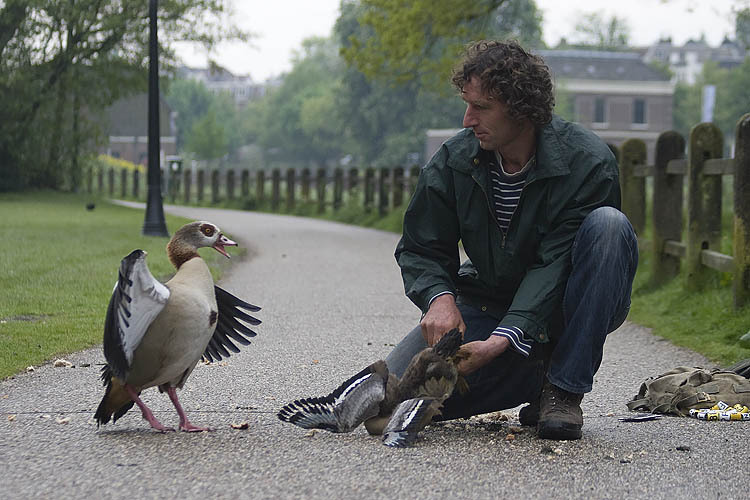 The Egyptian Goose origintd from Africa, south of the Sahara. There they breed at the onset of the rain season. Approximately 10% of the breeding birds has a second brood. After breeding for approx. 29 days the young are capable of flying after approx. 72 days. 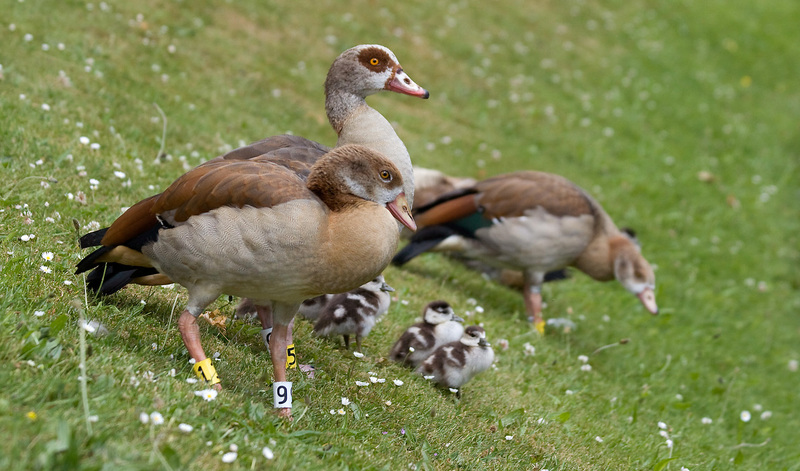 The first Egyptian Goose bred in 1967 near The Hague. 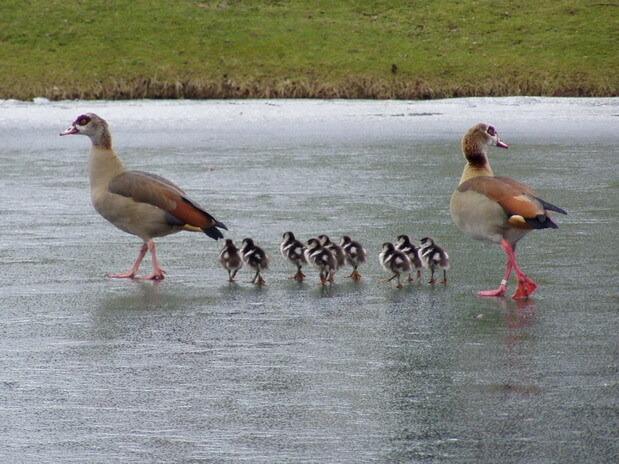 In The Netherlands the Egyptian Goose breeds in (early) spring. 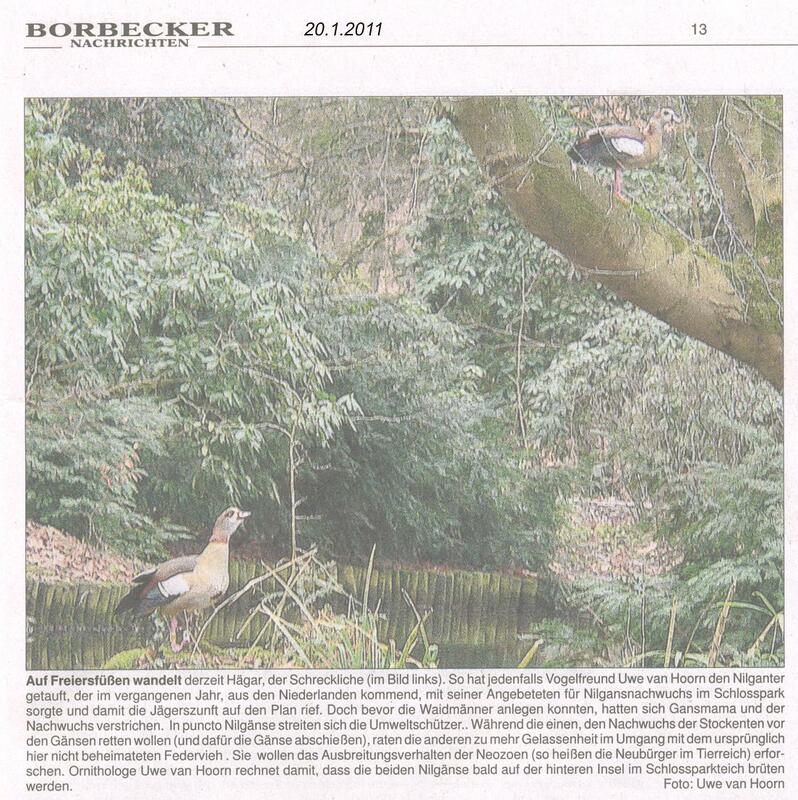 In the city parks of Arnhem every year in January or February the first pairs are observed with their young. The earliest ever had young in December 2004. The early (2-3) pairs often have a second brood. Per succesful brood most often 5-10 young become capable of flying. Outside the city, the first young are seen at the end of March. The winter of 2008/2009 was cold, with a period of frost from the end of December until the end of January. The early pairs have suffered from this. Similarly, the pair in the pond near Musis Sacrum, in the centre of Arnhem. 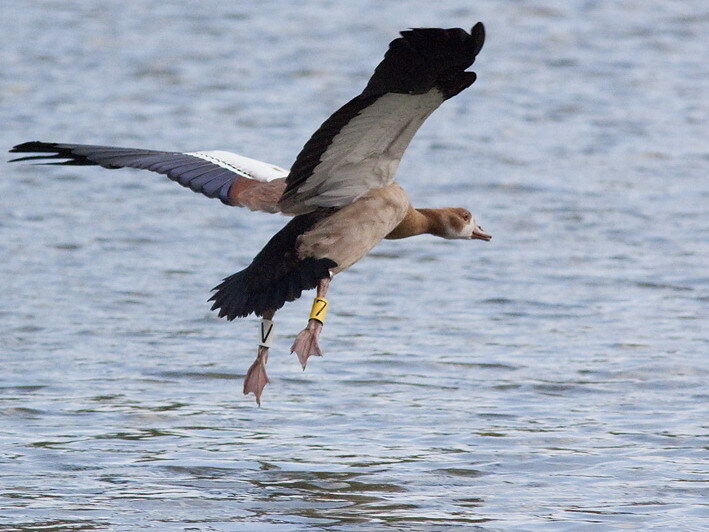 The male of the pair was ringed by me as an adult in 2001 and now has its third female. His current partner is ringed as a young in 2005 and they are together since 2007. As of Jan 1st 2009 the pair with just hatched young were walking across the ice, ... but this did not end very well. Three weeks later, all the young were dead. Irrespective of this, this pair succeeded in raising two broods which were capable of flying. This male has 2 successful second broods every year. But two generations of young simultaneously, I have never seen this ! Also in the literature I can not find anything about this. The old young were agressive now and then versus the smaller young. Therfore the male was near the older young and the female was near the small young. But standing next to each other was possible too. In the Table below the observations are shown. 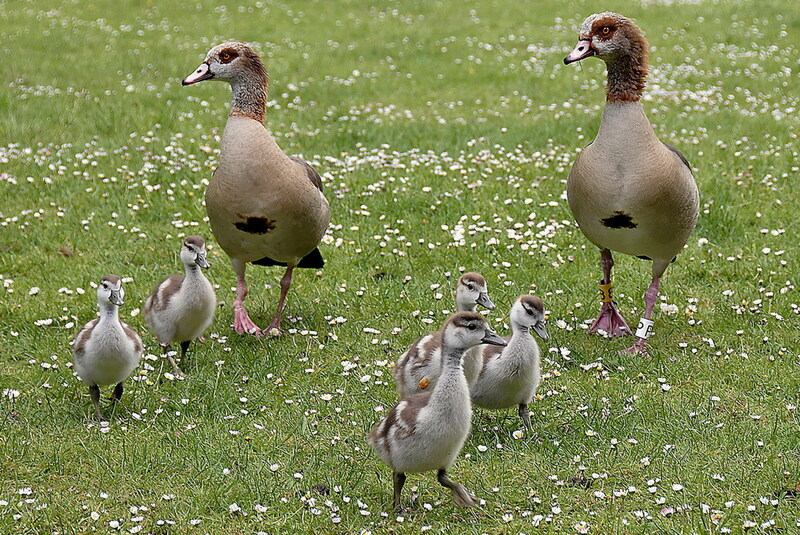 Egyptian Goose with young on Jan 1st 2009. © Frank Majoor. 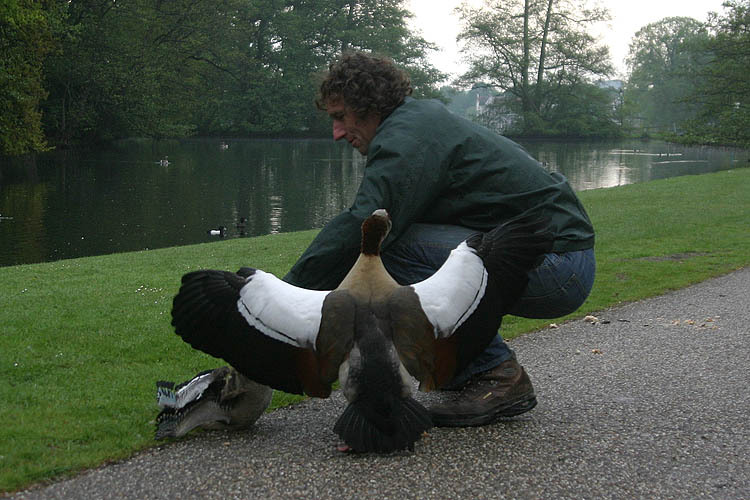 In the article Aspects of the biology of Egyptian Goose Alopochen aegyptiacus colonizing The Netherlands Rob Lensink covers, among other issues, the population-changes in the Egyptian Goose in The Netherlands. © Frank Majoor. Website update 22-01-2016.